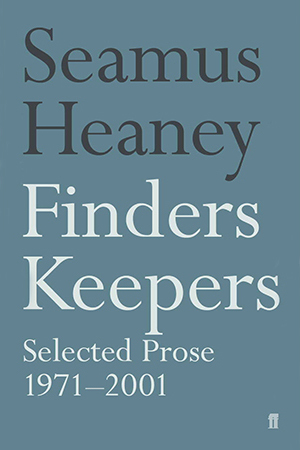 Finders Keepers gathers together three decades of Seamus Heaney’s prose, selected by the author and published in 2002. Whether autobiographical, topical or literary, these essays and lectures focus on questions of how a poet should properly live and write, and of what their relationship should be to their own voice, place and heritage. As well as being a selection from Heaney’s three previous collections of prose (Preoccupations, The Government of the Tongue and The Redress of Poetry), it includes material from ‘The Place of Writing’, the inaugural series of Richard Ellman Lectures which he delivered at Emory University in 1988. The volume also features pieces not previously collected in book form, ranging from short newspaper articles to lectures.